Parents faced with telling their children about the decision to euthanize a family pet have asked me how to handle this delicate topic with their children. What should we tell them? How do we make them understand? Should they be there?—are all questions I am asked. First and foremost, I urge the parents to be clear and honest when discussing euthanasia with their children. Too often parents try to soften the whole experience by being too vague or giving too much information—this can be confusing and generally backfires. Start by explaining that the pet is very old or sick, is in pain, and that there is no operation or medicine that can fix him. Tell your children that with the help of the veterinarian, we have the ability to stop the pet’s pain with a humane and gentle procedure called euthanasia. We can choose euthanasia for our pets so that they won’t suffer. Let your child know that when loving and caring for a pet, we must sometimes make this difficult decision. Children often take their cues from how you as the parent share this information. Children are open and resilient, they tend to accept what their parent is telling them including that their pet will be euthanized and it is the best thing that can be done for them. The next question is deciding if children should be present for the euthanasia procedure. Many factors come into play: the age of the child, the personality of the child, their relationship to the pet, and if your veterinarian allows children to be present. In many cases you can make arrangements that best meet the emotional needs of your family while ending the suffering of your pet. This may mean having a veterinarian come to your home, making an after hours appointment with your regular veterinarian, or coming to a 24/7 hospital like DoveLewis where we provide a special “comfort room” where family members can be together with their pet during the procedure. If you decide that you will invite your children to attend the euthanasia it’s a good idea to explain the process to help prepare them. The veterinarian will either place a catheter in the pet’s paw or inject the euthanasia solution directly into a vein. The euthanasia solution is like a massive overdose of an anesthetic, depressing and eventually stopping heart function. Once the injection starts, the process takes only seconds. Most often, the animal may take a few deep breaths before breathing stops. They can make a sound like a cry at this stage, but it is just the breath passing through the vocal cords. They are too deeply sedated to make real vocalizations. The bowels and bladder may empty as the muscles relax, or the limbs may twitch as the last nerve impulses fire. None of these things are signs of pain or the animal ‘fighting to live,’ but it can be confusing or hard to see if you aren’t prepared. Sometimes, none of these things happen and the animal simply transitions from life to death without any visible signs, their eyes often remaining open. The veterinarian will check for a heartbeat with the stethoscope and pronounce the death. There is no way to predict beforehand how the euthanasia will go, and any variation is normal. Knowing what you can expect and your child’s emotional maturity level, are important factors in your decision. Not every child will be ready at the same age. 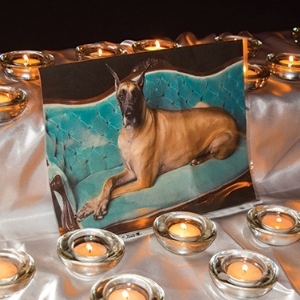 For many children, having the opportunity to say goodbye to their beloved companion at home, sending them off with a goodbye letter or drawing a special memento is best. The important thing is giving them the opportunity to say goodbye. Ultimately, you will need to make a judgment call based on your knowledge of your child. If you have an older child or teen that is capable of making an informed decision, it should be respected. Teens will go through a grief process similar to an adult, and having some control of their involvement may help them mourn. Whatever you choose, remembering your pet as a family and sharing your grief for your beloved pet with each other at home, can help children and adults alike through this painful time. To be honest, I've had to explain the process to children, teenagers, adults, and seniors. They all need this special attention to detail; oftentimes emotional maturity goes out the window when it comes to saying goodbye to a life companion. I've sat down with children until they were ready to say goodbye and I've offered a shoulder to the most unexpected, tough looking men because they couldn't handle the burden alone. This is a wonderful article and shares some good information for the new technician or doctor that hasn't had much experience with this aspect of our profession. Thanks for your comment and I'm glad you enjoyed this article. It's so true that saying goodbye to a family member is difficult to accept, regardless of age. I'm sure clients that have had the opportunity to work with you are very appreciative of your attentiveness and support.